I know, I know. Pugs. So ugly they’re cute! Pugs are my happy place. They snort, they snuff, they wear cute little costumes while cavorting in meadows and generally being adorable. And yet, there is this photo. It should be pure win-sauce. 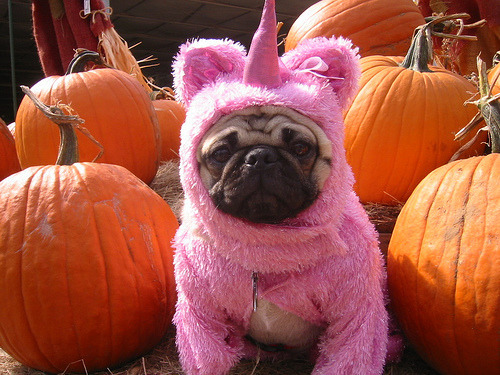 I mean, it’s a pug, dressed as a unicorn. In a pumpkin patch. Sounds like win to me! And yet…. it kinda confuses me. What is this? I don’t even…. So weird pug photo, I salute you. You are the first result in google images when I search “Pug in Costume”, which means I see you on an almost daily basis. No lie. I admit, the first thing I thought of when this week’s theme was announced was the fifth Doctor. If that sentence made no sense to you, then you’ve been missing out on some amazing television. But then I remembered the best snack that has ever existed. As a side note, while you can make this with peanut butter, the true ants-on-a-log aficionado knows that it’s best with cheesy cheese spread (we use C’est Fromidable! but you may prefer another brand). Just like everything else in this world, it’s better with cheese! Gentle readers, let me tell you a true story ripped from the pages of my own life. I probably had a number of bus drivers in my formative years, but I only remember one. She wore a kitty cat sweatshirt, from which she had removed the arms. Her hair clung to her scalp like a felted sheep, and she brazenly smoked her cigarette out the side driver window. I live in awe of that woman.